Paella Night - You're Making a Mess!You're Making a Mess! Last night, Sara and I hosted 6 of our friends for a Spanish-themed dinner party. It was the biggest full-on dinner party we’ve had so far, and I had promised paella for the crowd. I’ve made paella several times, but this was the most people I’ve ever cooked a full dinner for, so it was a bit more intimidating than a normal Sunday dinner. We started cooking and preparing at about noon that day, and had everything in place by the time the guests arrived. The night started with some appetizers — Sara made her amazing bacon-wrapped, almond-stuffed dates. If you’ve had normal bacon wrapped dates, let me tell you, the almond is a revelation. Dipped in a tangy sauce made with apricot jelly and balsamic vinegar, these little rolls are heaven on a toothpick (Unfortunately, I don’t have a picture of these, or Sara’s equally amazing flan — but if she starts a food blog, these should be the first entries). On my end, I made a tortilla española, or Spanish omelet. 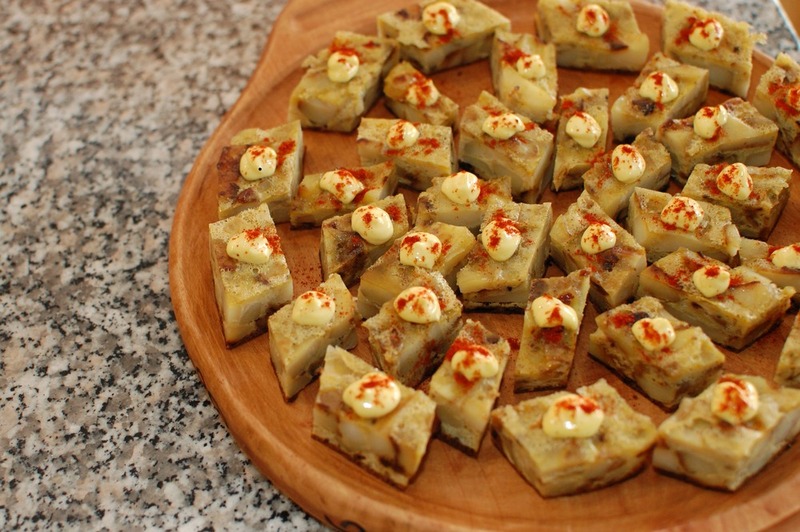 One of my go-to tapas, tortilla española is made with pan-roasted potatoes and onions, bound together in omelet form with beaten eggs. I topped it off with a dollop of garlic saffron aioli (piped through the corner of a ziplock bag) and finished with a shake of Spanish paprika. The creamy, saffron-spiked aioli and bright, smoky paprika went perfectly with the savory, salty goodness of the onions and potatoes, so if you make the tortilla, do the aioli too. We rounded out the first course with a delicious selection of Spanish olives, tomatoes and cheeses, courtesy of my friend Caroline. Along the way, we staved off thirst with crisp, bubbly Cava (courtesy of Chris, Mike and Jen-Jen) and cool, fruity, deep purple sangria (thanks JM2K). The main attraction was, of course, paella. There are a few things in my mind that make a great paella — the occasional bite of smoky chorizo, the crispy rice (called socarrat) at the bottom of the pan, and the sweet floral aroma of saffron that hits you as you bring the rice to your mouth. My general procedure is to begin with spicy chorizo, sauteeing it until the sausage pieces turn a dark brown, almost black. Chorizo is a blood sausage, so it’ll get nearly black when they’re done — wait for this stage, and you’ll be rewarded with crisp, crumbly slices. From there, I add my onions and garlic, sauteeing them for about 5 minutes in the chorizo fat. Next comes the rice, enough to cover the bottom of the pan about a quarter inch. The next steps will be familiar to those of you that have made risotto. Toast the rice for a few minutes until it starts to get a bit brown, fragrant, and crackly. Then, add in your liquid a few ladlefuls at a time, allowing the rice to absorb it slowly. For my liquid, I combine chicken stock and clam juice, and add the shells from the shrimp. I simmer these shells for a while (about a half hour if you have the time, longer is fine too) to add a fresh shrimp flavor, and then remove them. About 5 minutes before you’re ready to add the liquid to the rice, crumble a generous pinch of saffron into the broth and allow it to infuse, turning the stock a bright shade of yellow. Continue to ladle the stock in until most of the liquid is absorbed — I generally shoot for 1.5 cups of liquid for every cup of rice. When you’ve hit your target, start adding your seafood, peas and chicken. 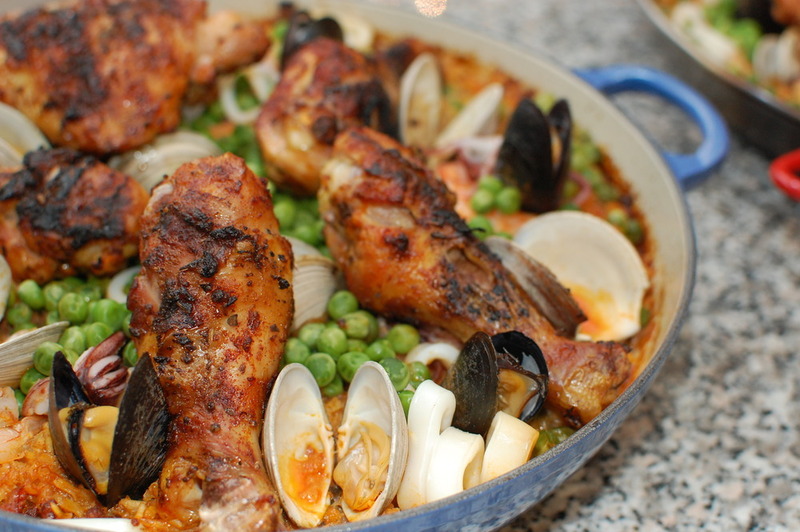 I take a more-is-more approach and add mussels, clams, calamari, shrimp, peas, and chicken. This time, I pre-cooked the chicken on the grill (but not all the way) to give it crispy, crackly skin before it went in the pan. Finally, I covered my pans loosely with foil and stuck them into the oven for about a half hour to cook the seafood and let the rest of the liquid absorb. Traditionally, paella is cooked entirely over an open flame, so the oven part was cheating; however, with guests over, I was happy to let the food cook hands free for a half hour or so while I chatted with my friends. We finished off the night with an outstanding vanilla orange flan that Sara made. Flan is in my top three favorite desserts (with key lime pie and tres leches cake), so this capped off our fiesta perfectly.